Summer LEAH applications are OPEN! The LEAH Project has TWO summer internship programs for interested high school students. Both applications are open now and are due by March 22nd. Serve with the LEAH Project! AmeriCorps Massachusetts Promise Fellows deliver the resources young people need to be successful in life by creating, managing, and leading meaningful out-of-school time programs for youth in grades 6-12. Fellow projects focus on mentoring, social and emotional learning, college and career readiness, academic enrichment, and community service-learning. The Massachusetts Promise Fellowship achieves this by placing AmeriCorps Fellows with schools, non-profit organizations and state/local government agencies that focus on fulfilling the needs of our youth by providing: a caring adult, a safe place, a healthy start, a marketable skill, and an opportunity to give back. BOSTON- The Leaders through Education, Action and Hope (LEAH) Project is a college access, job readiness, and youth development initiative that recruits, trains, and supports low-income, high school students of color in Boston Public Schools (BPS), known as “LEAH Mentors,” to teach science, technology, engineering and math (STEM) lessons and provide homework help to elementary school students. The Fellow will lead and enhance the LEAH Project’s College Readiness Program (CRP), working directly and consistently with 20 youth (juniors) throughout the year. Through the CRP, the Fellow will work to increase the college-readiness of LEAH Mentors including managing a tutoring program, planning college visits, parent engagement events, and college workshops, facilitating Mentor orientation and weekly meetings, conducting site visits, and meeting individually with Mentors. Apply ASAP! Applicants are hired on a rolling basis. Applicants must apply through our General Application by May 1st, 2018 and select the host site(s) of which they are interested in applying. Host sites will reach out to schedule a first round interview. If you have additional questions or would like to contact a host site, please see the e-mail contact listed above. Positions will continue to accept applications until they are listed as filled. Ø Interviews will take place during May, 2018 and reasonable accommodations will be made available for interviews upon request. Ø Selection decisions will be made on or before June 1st, 2018. All position offers will be provisional until 2018-2019 federal funding has been confirmed. Ø More information about The LEAH Project at Health Resources in Action can be found at www.leahproject.org. The Massachusetts Promise Fellowship is committed to providing equal opportunities. We serve and partner with diverse organizations, and are dedicated to non-discrimination. It is our policy to ensure that all individuals with whom we are in contact are treated equally without regard to age, color, disability, gender, marital status, national origin, religion, sexual orientation or expression, or veteran status. We require that all our partners make reasonable accommodations for interviews and service for any and all individuals with a permanent or temporary disability. We actively partner with organizations representing minority concerns and interests to build high-performing teams that mirror the communities we serve. New LEAH Mentor Summer 2018 Applications are out! Boston, November 2017 – The LEAH Project at Health Resources in Action received a 3-year $1.2 million grant through the BNY Mellon YouthLeaders program, funded by the Arthur F. Blanchard Trust. This initiative will provide youth with meaningful job responsibilities, promote career readiness and leadership skills, and expose youth to college and career pathways with a focus on technology. “Health Resources in Action is proud to support youth programs like the LEAH Project and is honored to have been chosen as a partner for this exciting initiative from the BNY Mellon YouthLeaders Program to provide Boston’s youth with opportunities to explore the technology field while also receiving much needed wraparound services,” HRiA President Steven Ridini said. The Leaders through Education, Action and Hope (LEAH) Project’s mission is to cultivate the power of youth to transform their lives and communities through science, education, and service. LEAH is a science, technology, engineering, and math (STEM), college readiness, and workforce development program for low-income Boston Public School (BPS) high school students of color. “We are thrilled to receive this multi-year, technology-focused grant to expand the LEAH Project’s programming to technology so that our young people do not get shut out of one of Boston’s fastest growing labor markets. These funds will also enable us to provide college and career readiness to more Boston high school youth participants than ever before,” Lisa Aslan, LEAH Program Manager said. Through the BNY Mellon YouthLeaders Program funding and in partnership with Learn to Teach, Teach to Learn at the South End Technology Center and Broadening Advanced Technological Education Connections (BATEC) at UMass Boston, the LEAH Project will provide year-round internships for 36 Boston Public School high school students. The LEAH Project will also provide opportunities for youth to explore STEM topics and careers (with a technology focus), get ready for college, and learn professional skills. Youth are trained to teach STEM curricula to elementary school students at afterschool programs, take part in STEM workshops and classes, and participate in college visits. Youth develop their own STEM skills and knowledge and reinforce these skills as they learn to be teachers to elementary school students. - Computer science courses with BATEC at UMass Boston. - Teaching a new technology-focused curriculum to elementary school students in after school programs developed by partner Learn to Teach, Teach to Learn. - Meetings with a “Technology Speaker’s Bureau”, a group of technology professionals who will share over several meetings their academic and career pathways. - Technology-focused internships for seniors that synthesize the professional development and technology knowledge they have gained during their three years in the program. The LEAH Project looks forward to leveraging the generous grant from the Arthur F. Blanchard Trust to continue providing STEM career exploration with a technology focus as well as college and career readiness support to more of Boston’s high school youth just like Andrianne. Applications are OPEN for youth to join the LEAH Project! The LEAH Project is a year-round internship program for Boston Public School (BPS) high school students to explore science, technology, engineering, and math (STEM) topics and careers, get ready for college, and learn professional skills. Youth are trained to teach STEM curricula to elementary school students at Boston afterschool programs. Youth take part in STEM workshops and classes, meet weekly for professional development workshops and opportunities, and attend college visits. Youth develop their own STEM skills and knowledge and reinforce these skills as they learn to be teachers to elementary school students. LEAH youth plan and implement workshops for their peers, work with LEAH staff to plan and lead events, and increase their youth leadership roles within the program. LEAH youth work at afterschool and summer camp programs close to their homes or schools teaching STEM lessons to elementary school students (you will be trained in these). When not teaching STEM lessons, youth serve as junior staff, for example, planning fun learning activities and serving snack to the kids. The program is now recruiting for this school year with youth continuing with LEAH into next summer. Youth can earn up to $4,600 in stipends in total over the school year and summer. Boston, September 7, 2017 – Health Resources in Action has received a five year, $1.25 million Science Education Partnership Award (SEPA) grant from the National Institute of General Medical Sciences (NIGMS), National Institutes of Health (NIH) to expand its LEAH* STEM (science, technology, engineering, and math) education program for Boston and Cambridge public high school students. Health Resources in Action (HRiA) has partnered with the Boston Private Industry Council and Massachusetts Institute of Technology (MIT) to provide opportunities for high school students to get a head start towards careers as leaders in biomedical research. HRiA’s LEAH project (Leaders through Education, Action and Hope) is a STEM, college readiness, and workforce development for Boston public school students. “We are thrilled to receive this NIH grant to support the mission of the LEAH Project. These funds allow the LEAH Project to provide hands-on lab experiences for our high school students, many of whom do not have science labs in schools,” commented Lisa Aslan, LEAH Program Manager. Training in biology lab skills through a 4-week lab experience at MIT as rising juniors. 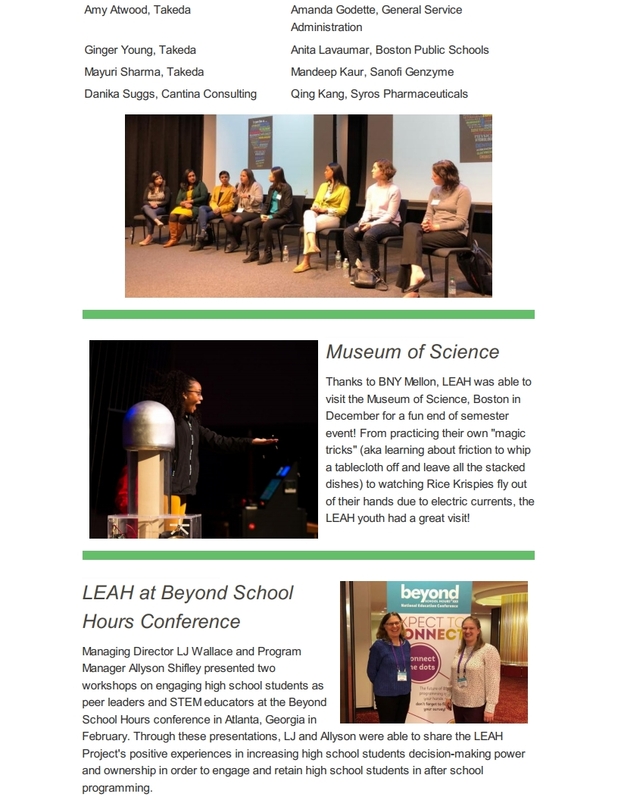 STEM teaching and mentorship for elementary school students through the LEAH program. Summer research internships throughout Boston’s world-class research labs as rising seniors. College admissions counseling through LEAH. Knox Scholars is named after William J. Knox, the grandson of slaves, who went on to earn degrees from Harvard and MIT. He contributed to the Manhattan project and had a productive career at Eastman Kodak. “My grandfather [Dr. Knox)] had to sleep in the kitchen at Harvard, because Black men were not allowed in the dorms,” said Dr. Lynn Porter, a Boston pediatrician and advisor to the program. This summer, HRiA and MIT enrolled 16 high school students in a LEAH pilot. This first cohort and their families were welcomed to the program by Nobel Laureate Phil Sharp, MIT biology department Chair Alan Grossman, Bob Sege and Lynn Porter. Phil Sharp reminded everyone that "a college education is a path to freedom". The students completed the pilot summer lab course, under the direction of Drs. Mandana Sassanfar and Vanessa Cheung at MIT. 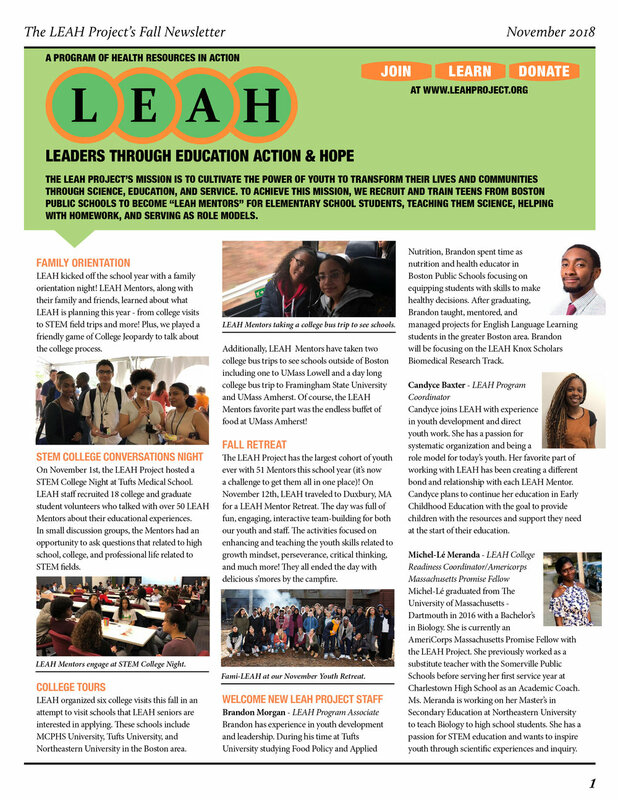 The Leaders through Education Action and Hope (LEAH) Project is a STEM, college readiness, and workforce development program for Boston Public School (BPS) students. 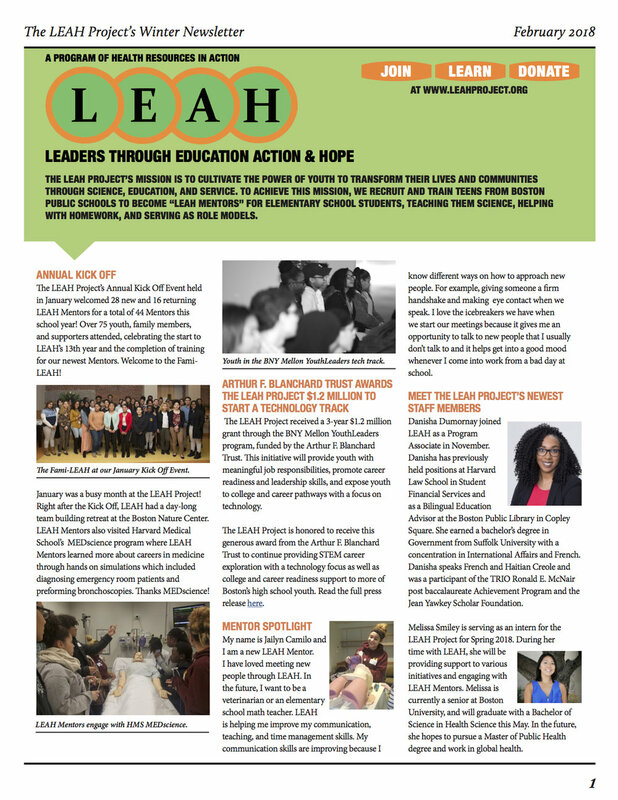 Established in 2005 through the Boston Public Schools (BPS), the LEAH Project has a mission to cultivate the power of youth leaders to transform their lives and communities through science, education, and service. LEAH joined HRiA in 2013. HRiA is a national nonprofit public health institute located in Boston, MA with a mission to help people live healthier lives and build healthy communities through prevention, health promotion, policy and research. Additional information is available at www.leahproject.org and www.hria.org.